While a government shutdown is looming, a video of Nancy Pelosi (D-CA) has emerged, showing the House Minority Leader inside of a bar in Washington, DC. Although she was all smiles in the clip, things are not looking good for the Democratic leader now. 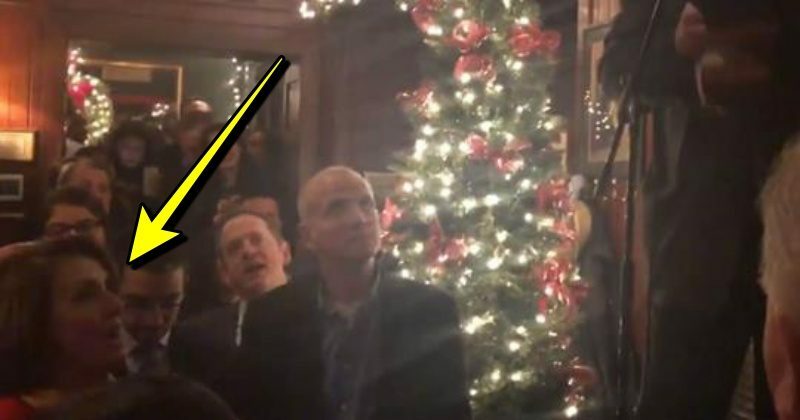 On Wednesday night, House Minority Leader Nancy Pelosi (D-CA) was caught out at a bar dancing her cares away with fellow Democrats at Rep. Joe Crowley’s going away party. Crowley was defeated in the New York primary by Socialist-Democrat Alexandria Ocasio-Cortez. During the event, Crowley played the guitar and sang while Pelosi and her friends, who appeared to have had a bit to drink, danced the night away. Initially, it appears to be just some good old holiday fun, but more than just a few people have taken issue with the sight when all things are considered. Of course, this video isn’t so shocking because Pelosi is seen letting loose at a bar. We see her acting a fool at press conferences on a near-daily basis, so this is very mild. What is quite shocking, however, is that she would be so seemingly care-free only hours before a looming government shutdown. Apparently, she doesn’t think the prospect of a shutdown is a real big deal. As we inch closer and closer to midnight Friday, though, it is looking more and more likely that a government shutdown will take place. The Democrats have not done one thing to work toward a compromise on border wall funding with President Donald Trump, and he is not willing to sign a spending bill which does not provide for the wall. But, of course, if a Democrat were asking for money to finish the wall, Pelosi and her cronies would be all about it. As President Trump noted in a recent video, liberals have always been in favor of walls. Only now that he is demanding to secure the border, they balk at the idea. This is not the first time Pelosi has made it abundantly clear that she cares more about illegal immigrants — some of them dangerous criminals and hardened gang members — than she does about the safety and security of American citizens. It is truly stunning that, with so many Americans struggling, whether it be veterans who cannot find a job or get medical care or children who are going to bed hungry, that the Democrats will fight so damn hard for people who don’t even belong in this country. Then, in the next breath, they’ll vilify President Donald Trump for his efforts to put the needs and concerns of those struggling Americans first. Of course, this is the way things should work in Washington. It should go without saying that our lawmakers ought to put their constituents first. But, sadly, this only seems to be a concern of conservatives. It’s no wonder we see reports on a near-daily basis of an innocent young woman or a mother being violently raped or killed by an illegal alien who had already been deported multiple times. In the coming days, you can be sure that the Democrats will get on their high horse and try to convince us all that they did everything in their power to avoid a government shutdown. When they do, remember this video of Nancy Pelosi partying it up when she should have been rallying lawmakers to come to a compromise which could have left the government open and secured our border.